To be in charge of anything warrior roleplay, and to help tutor new members. 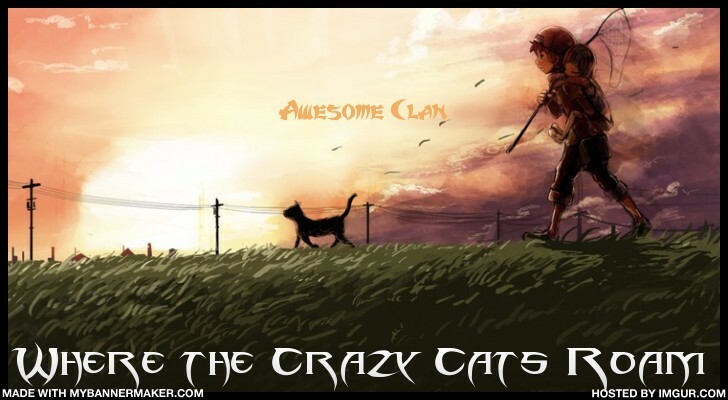 This guild keeps the number of cats each of the clans balanced and also helps make sure the clans are following the storyline. Also helping out and answering any questions of new users. Master a list of every character in Awesomeclan, and their relationships with each other. err, Willow, the Roleplay Guild is the Roleplay Librarian, Family Tree, and I think Roleplay Tutor Guild combined, so maybe you should put their descriptions together in the description of the Roleplay Guild. LOL! I had no idea we had actually remade some of these guilds...lol. I could be part of this. So in this guild you make it so every clan is balanced, make sure the clans are on the story line, and help answer questions new users have, right? Nothing else? Just makeing sure I got it right. Welcome to the Roleplay Guild, Dove! Shiningpetal-Creamy gold she-cat with royal blue eyes. Kits: Nightpetal, Frostheart & Rainstorm. Well, yeah, but if Shiningpetal's a queen, than she won't have an apprentice. And cats only list their kits if they are queens, so sorry, but we'll have to catch it and put it on the family tree quickly. EDIT: Eagle, is this good? Snowstar-Pure white she-cat with blind, blue eyes. Brownblossom-Creamy brown and red she-cat with green eyes. Waterclaw-Silvery grey tom with amber eyes. Amberfire-Red, orange and yellow she-cat with blue green eyes. Riverstorm-Blue tom with dark green eyes. Crowpaw-Black, grey and white tom with yellow eyes. Shadowheart-Pure black she-cat with blue eyes. Sunpool-Gold tom with dark blue eyes. Echopaw-Silver she-cat with amber eyes. Nightpaw-Black tom with amber eyes. Cherrypaw-Red she-cat with green eyes. Mosskit-Brown tom with blue green eyes. Petalkit-Black and silver she-cat with amber eyes. Lilykit-Silvery grey she-cat with amber eyes. Frostheart-Grey tom with green eyes. Willowfur-Brown she-cat with blue eyes. Okay so for my Moonclan cats, Scatterpaw, Cougarpaw, Wisteriafrost, Grapefur and Lunapaw only 1 is dieing in the Civil War. Cougar, will die after the civil war when he kills Whispersoul since he is like a murderer and all and loves to kill people so he kills Whisper. Scatter finds out and avenges Whisper by killing Cougar. So yeah. But Scatter doesn't get in trouble, though. For Grape, Wisty and Scatter they will live. I dont know what Amy wants me to do with Grape so I am just going to let her characters live unless I know that they have something planned for them. If she gives me complete control of her characters then I will kill off Grape in the Moonclan Fire. LOL, it makes sense that Moonclan and Lavaclan are the overpopulated clans since they have no enemies that they fight with. Anyway, is that good for me? And Eagle what are you going to do? For my cats, I have Rosefeather, Rubypaw, Aquafur, Solarpaw, Pebblecreek, and Pearlblaze. Aquafur and Solarpaw are going to die in the Civil War of course, and I might move Pebblecreek and Pearlblaze to one of the newer clans, so they can have kits. I think Rosefeather is becoming a medicine cat. And eaglestar said her plan killed off four of her cats, so that's a start, right? LOL, right? I mean, if they were in a battle with another clan, LavaClan or MoonClan would win by sheer numbers every time. Good thing MoonClan had a civil war. What is going to happen to Rubypaw? Oh yeah.... Then, I think I'll move Rubypaw away. hmmm. Cats need to die eventually, or with all the new members and influx of cats, all the clans will become overpopulated eventually. Do we have a time length when warriors retire? Any idea what clan she will go into? May i join this guild willow? Ocean, I think 6 months is good for a regular warrior (ex ones who get disabilities will probably immediately become elders) to become an elder. Rubypaw? I don't know. Maybe one of the ancient/new clans? How about for every bad thing that happens to the clan that leader has to lose a life? So for say Moonclan: Hurricane, Battle 1, Battle 2, Fire, etc? Plus, if that is not enough they can just lose lives like you said. From random events that happen to them :S Is that okay? Dawn, Twilight, Snow or Rain? Hmm...letmesee her descrip...(xD She is not even on the Moonclan Allegiance!) Um I think either Dawn or Twilight. She doesn't seem right for Snowclan or Rainclan. ARG! WE NEED TO GET BACK ON TRACK WITH THE GUILDS!!!!!!!!! Any ideas, guys, on how to make the guilds more active so they ACTUALLY DO THEIR JOBS?! First lets decide who are the leadera for each of the guilds and then deputies. Power Guild: Leader, ? Deputy, ? Storyline Guild: Leader, Oceanstorm. Deputy, ? Roleplay Guild: Leader, Willowstorm. Deputy, Eagletalon. Off Topic Roleplay Guild: Leader, Oceanstorm. Deputy, ? Time & Nature Guild: Leader, ? Deputy, ? Advertisers Guild: Leader, Eagletalon. Deputy, Jaybird. For the power guild, I nominate you (but maybe not, because you're already the leader of 2 other guilds), Jay, Runa, or me. Maybe for this we should have like, a user who is a leader/deputy person, and a medicine cat person as deputy and leader. I think for Time and Nature Jay should be deputy. Jay will deputy for Off Topic, then. For Power I say Eagletalon should be the leader since she is so cool For deputy, Runa. For more activity: More posting and more advertising, maybe? Thanks, I'm flattered. but isn't the guild limit 3? I'll post some ideas in the Advertiser guild, then. Wait so Eagle...what guilds are you apart of? Which ever one you are not of, you will not be and we will have to choose someone else.